To the relief of travelers, delays were minimal and lines appeared to be moving fairly swiftly at O'Hare International Airport by midday Wednesday. The scene was far different than what existed just hours earlier, when thousands of people were either milling about or sleeping on benches, the floor, and baggage claim conveyor belts, victims of an incident at a Federal Aviation Administration radar facility that virtually shut down the local airspace and caused hundreds of flight cancellations. Some customers told NBC Chicago they'd been told the backlog of flights, which already existed from severe weather earlier in the week, could take another day or two to get cleared up. "We got here and they told us that we're not flying until the next two days," said Zaid Isho, who was traveling from San Diego, California to Detroit, Michigan. He and his flight companions ultimately made their way to Midway International Airport to book a car so they could finish their trek but returned to O'Hare because they were unclear if luggage that had been checked through to Detroit would get to the final destination or remain in Chicago. "It's frustrating. I'm mad, too. But you've got to do what you've got to do," said Isho. There were just a few flight delays on the board Wednesday morning as airport crews did their best to get operations back to normal. Inbound and outbound flights slowly began resuming at about 4 p.m. Tuesday at both O'Hare and Midway after smoke inside Chicago Terminal Radar Approach Control halted planes earlier in the day. The FAA building on Bowes Road in Elgin was evacuated of all personnel at about 11:30 a.m. after smoke was seen coming from a vent shaft inside the building, Elgin police Cmdr. Dan O'Shea said. More than 1,120 flights were canceled between the two Chicago airports, according to the Chicago Department of Aviation. Some planes that were lined up on the tarmac left their place in line and returned to gates to avoid penalties. The U.S. Department of Transportation in December 2009 instituted new rules prohibiting airlines from keeping passengers on an airport tarmac for more than three hours. 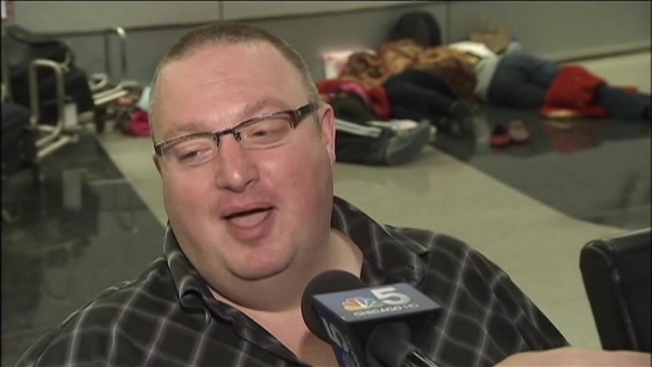 One traveler trying to make his way from London to San Francisco had a scheduled stop in Chicago. His flight was diverted on the way. "They diverted us to Detroit. I sat on the ground in Detroit for 11 hours while they tried to get a U.S. Airways plane," said a clearly frustrated Dave Nordell. "I had first class all the way yesterday. Today I don't, and they're unwilling to give me miles or $75 to compensate me. They're going to put me in coach and keep my money." The nation's TRACON facilities manage the approach and departure of aircraft for a specific airport or a cluster of airports within a defined geographic area. They differ from command centers, which guide planes through large sections of airspace. The towers at airports primarily deal with the movement of planes on the ground.